My son called from the pool to say that Nestucca Adventures was setting up for a SUP Yoga class and asked if I wanted to join in. I was across town in jeans and a sweatshirt. I wanted to, but I was 20 minutes out. Without gear. He called back and said it would take them a bit to set up and I could borrow a suit from the pool. I had a friend that was in the weight room and I asked Nate to pull her out to join in. So two of these gals are instructors at the pool for fitness, and one is a huge fitness crazy gal, and then me. I was pretty glad to be able to keep up for the most part. This was my first Yoga class. In full disclosure, I’m sort of a yoga againstavist, I’m not into the the ‘energy’ chat and all. 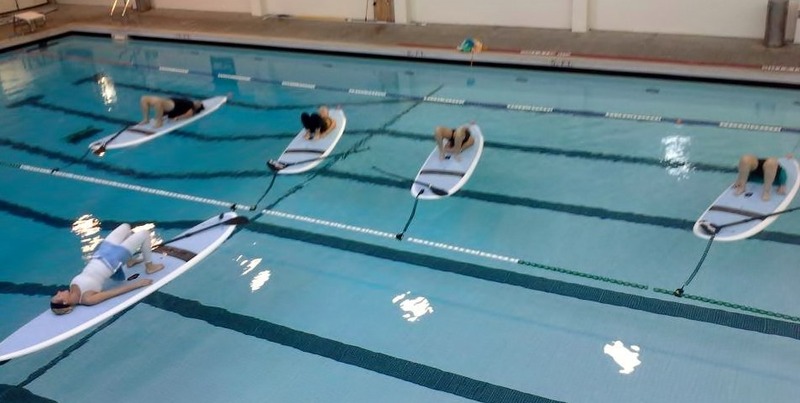 I have to say that I really enjoyed the stretching and muscle control, especially being on a SUP board in the pool. I loved the feeling of the 84 degree water with the Stand Up Paddle board instead of the cold lake or ocean. This was an introduction class. I think I’d like to buy a 5 pack class and really get to know how to do this so I can do it in the mornings in my own back yard. I’m off to a Dr’s appointment with Hubby or I’d go on and on and on at how I never imagined in my wildest dreams that I’d be SUP Yoga’ing this year!!! Praise God for Good Health! 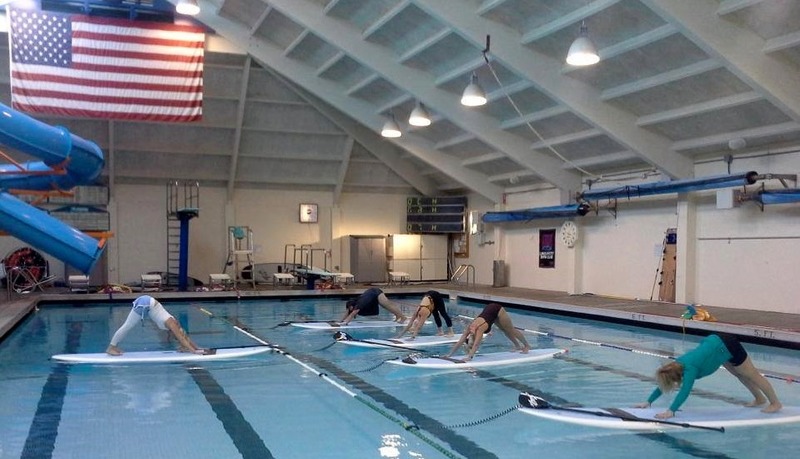 This entry was posted in Beach Schooling and tagged #Yoga, Indoors, Pool, Riviera, Stand Up Paddle, SUP. Bookmark the permalink. 1 Response to Stand Up Paddle Yoga! Congrats! How much is balance an issue, since you’re in a pool?